For me, there have been many special evenings shared with family and friends out at a restaurant. Wanchai Ferry and Macaroni Grill Dry Dinner Kits want to help you recreate that special evening in the comfort of your own home. 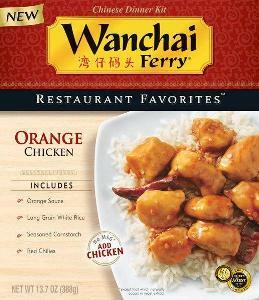 Tonight for dinner, I prepared the Wanchai Ferry Orange Chicken meal. I was worried when I first opened the box that that there wouldn't be enough rice for the meal, but in the end, we actually had leftover rice after feeding the family. The meal was surprisingly simple to prepare. After putting the rice in the water, I sliced my chicken into strips and coated it with the seasoned corn starch. Add the chicken to the hot oil in the pan and cook until golden brown. Add the chilis, the orange sauce and some water. Let it simmer and then serve. I liked that the rice was sticky, like it is when you order it a Chinese restaurant. I liked that the sauce was flavorful with a touch of spice, but not too spicy that the kids wouldn't eat it. Both my husband and my son were unsure when I told them that we were having Orange Chicken, but both enjoyed it and had more than I originally served to them. The Macaroni Grill meals, we have enjoyed the Creamy Basil and the Chicken Piccata meals before. As a busy mom, I find that these dry meal kits offer me a meal that is quick and easy to prepare, that is full of flavor and that my family enjoys. It helps me on those busy weeknights when I need a meal that I can quickly prepare for my family. For more information and dinner tips, visit WanchaiFerryAtHome.com and MacaroniGrillAtHome.com. And be sure to follow Macaroni Grill on Twitter and “Like” the Facebook page to keep up with all of the latest news on your Macaroni Grill favorites! 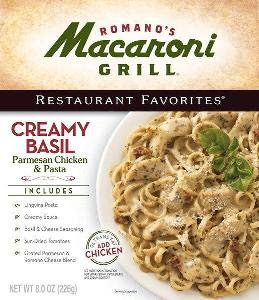 You can get a money saving coupon for $1.50 off two packages of Wanchai Ferry and/or Macaroni Grill Dinner Kits here. Through MyBlogSpark, I have one Date Night prize pack that includes one Wanchai Ferry dry dinner kit, one Macaroni Grill dry dinner kit, and a $25 Visa gift card that you can use to create a magical date night at home to giveaway to one A Busy Mom of Two reader. To enter: Leave a comment sharing tips for having a fun date night at home. The giveaway will remain open until November 18th at 6 pm and is open to residents of US only. Winners will be selected using Random.org random number generator. The winners will be contacted by e-mail (Please make sure that your email address is either in your comment or clearly visible on your profile or blog) and will have 48 hours to respond or a new winner may be selected. No compensation was received for this post. I received one Date Night prize pack for my family and one to share, through MyBlogSpark, courtesy of Wanchai Ferry and Macaroni Grill. I also was provided with product information and a second prize pack to share with a reader. I like making dinner together. We always have fun. We like to watch movies together after the kids have gone to bed. Tips for having a fun date night at home- wine and candles plus desserts- these make great date night at home. a fun date night at home- send the kids to grandma's house, cook dinner together, light the candles and stay up late and sleep in in the morning. My husband and I used to specify a certain day for date night. On that night the kids went to bed early. If they behaved they got a treat later. We'd snuggle up and watch movies and eat $1 boxed candy and drink a 2 liter. A fun date night at home usually involves cooking a fancy dinner together and watching a movie we can both agree on. We usually get something from Redbox (preferably using a free code) or borrow from library or friend. Then hopefully send the kids to bed early so we can have some relaxed time together. I like to pick up a couple of movies to watch after dinner. Thanks for the review and giveaway! use candles, they make everything special! I suggest turning off all electronic devices, leaving the kids at grandma's house for the evening, and spending some alone time without interruptions. My best tip....take the kids to grandmas! Add a RedBox and that's a great night in! I think putting the kids to bed early and staying up and having dinner followed by playing cards!! We rent a movie and make dinner. Something as simple as putting together a jigsaw puzzle or playing a board game can turn into a night of talking and laughing and make for a great date night. I receive the daily updates. Thanks! My tip is not to expect too much. When it is relaxed it is more fun! Even though it is not at home; spending the night at our seasonal spot campground is our at home date night. Just us, and only what WE want to do! We like to watch romantic comedy movies, go for a long drive down roads we've never tried before, and eat Italian foods, whether cooked at home or out! A date night to me is not having to cook. Although, if it were easy to make, it might be worth staying home... especially in the cold weather. Redbox or card games are our favorite. use music to set the mood! A fun date nite is spent cuddling on the couch and forgetting for a short while that we have children. We follow you on email and LOVE the updates and information. A fun date night tip is just go with the flow. Don't try to schedule the fun out of a date night. So many times I have set this for this time and rush here for this only to feel stressed out by the end. I get your updates on my email every day. Our best date nights include a fire outdoors in our fire pit. Sitting around talking and sipping hot coco for hours watching the stars and moon. We love to make a special dessert! After the kids go to bed we like to have a special dessert and watch movies together. We love to get carryout from a favorite place, then have a picnic in the living room, watching TV and talking. Right now we can't afford anything "fancy" for date night, so I bake from scratch, and sometimes we share a take out (the chinese place here gives HUGE servings) come home and sit together and eat it with the fancy chop sticks we were given as a gift from japan. I say do something you haven't done before like a fondue night! watching a movie and snuggling on the couch, alone! We usually cook dinner together, share some wine, and then if it's nice out, take the dog for a long walk. Though last time we walked the dog together, he threw himself into the river by our house by accident and then freaked out. We let all four kids spend the night at grandmas and enjoy the house to ourselves! Occasionally my husband and I will wait to eat until after the kids are in bed. He'll run out and pick us up some Subway and then we'll watch a movie we've DVR'd or picked up from Redbox. Dinner and a movie. For a great night, I like to put on soft music in the background. I like it when my husband and I cook together then snuggle on the couch and watch a movie. For our date nights we like to watch a movie or show from Netflix, eat dessert and have some wine or something else to warm us up. If we feel silly, we will watch Mythbusters while we are enjoying our drinks, because that show gets so much funnier that way! Wanchai Ferry and Macaroni Pasta are oh so good, I love both! We subscribe by e-mail, too! We like to play card games, or the Wii together! Send the kids to grandmas house!!! Fun date night at home is having a picnic on the deck and watching the sunset. Some of our best date nights at home come when the grandparents take our son. I often will cook dinner and we'll watch a movie together! glass of wine watching a movie while the kids are sleeping. I think it is always fun to make dinner together. Of course with kids though that makes it hard. We usually put the kids to be early and snuggle while watching a movie. You'll love it too! They have new ideas daily. And all of the ideas are free! something as simple as just going for a walk in the evening is completely free, extremely enjoyable, and a great time to talk! We like to play card games at home! A fun date night for us includes not cooking, so we have food delivered, light candles and watch movies. A great date night at home to me would consist of sending the kids to their aunties, making his favorite dinner (chinese) and staying up late watching scary movies. Following you on Twitter as lyndsey1stunna. I am a Twitter follower (LuckyDuckyToo). Make sure to start it when the kids are in bed! We LOVE having dinner then watching a movie together for date nights in (after the children are asleep)! We put the kids to bed and get a Redbox movie. It's more comfortable at home anyways. I signed up to recieve daily emails. We like to make dinner together and rent a movie and relax. It's even better than going out sometimes. A good date night would include eating a tasty dinner(nothing too complicated), watching a funny movie and of course topping it all off with a yummy dessert! We like to watch a movie and eat our fave dessert! Good food and no TV for me.